Poloniex is proud to list Grin and to give back to the Grin project by pledging a portion of all Grin transaction fees on Poloniex to the Grin General Fund for the next year. Deposits are currently live and withdrawals will be available in the coming weeks. Grin is a community-driven cryptocurrency focused on privacy and scalability that leverages the MimbleWimble protocol. Grin transactions operate in a fundamentally different manner relative to other cryptoassets, and Poloniex has taken measures to develop the most user-friendly and secure solution for storing and trading Grin available on the market today. The Grin project is unique in that there was no ICO, the developers building it remain mostly anonymous, and new tokens are released only via PoW mining rewards. While there is a network of volunteer developers committed to the success of the project, there is no developer subsidy or regular source of income to incentivize their work. As such, Grin relies on voluntary contributions to fund its development. Circle and Poloniex have pledged a portion of all transactions fees to help fund further Grin development because we believe in supporting crypto projects which encourage distributed, voluntary development and fair, decentralized methods of token distribution. We hope to see these funds support ongoing security audits, developer campaigns, bug bounties, open-source development of Grin ASIC design and general endeavors that strengthen the Grin ecosystem. This program will be reassessed after 12 months. 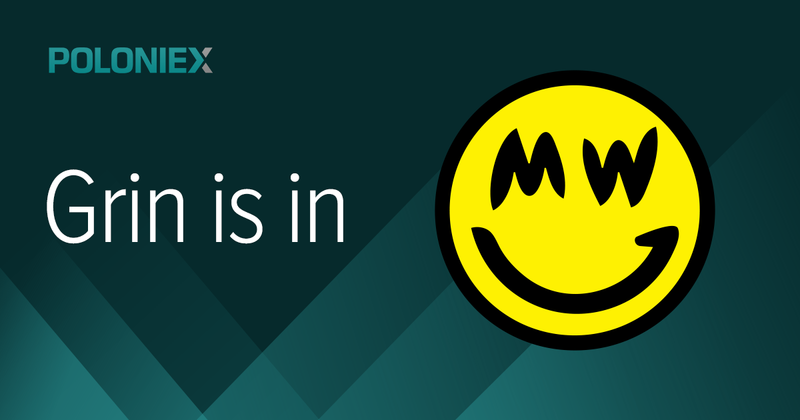 Grin’s origins can be traced back to an anonymous individual going by Tom Elvis Jedusor posting the MimbleWimble whitepaper to an internet forum in 2016. The MimbleWimble protocol, which is a reference to a tongue-tying curse from Harry Potter, introduced novel solutions for both scalability and privacy. The protocol was improved upon by others including cryptographer Andrew Poelstra, before the Grin project was posted to Github by anonymous developer, Ignotus Peverell, later that year. Grin went live in January 2019. Method 1 — URL-based: URL-based deposits reduce Grin deposits into a single step and will appeal to users seeking a simplified experience. It will also be useful for those depositing Grin from a mining pool or other exchange. Method 2 — File-based: File based deposits involve Poloniex and the customer passing a unique file back and forth before broadcasting the transaction to the Grin network. This method is best suited for advanced users and for those who want to use Poloniex as their Grin wallet for peer-to-peer transactions. We believe that these methods, coupled with our sophisticated wallet infrastructure and 2-factor authentication, make Poloniex the most user-friendly and secure platform for storing and trading Grin. You can learn more about Grin deposits and withdrawals at our Support Center. For Grin miners interested in learning more about how you can use Poloniex to deposit and store Grin, please reach out to partnerships@circle.com for more information. The listing of Grin is only one of several recent initiatives we’ve taken to restore Poloniex as a premier destination for crypto enthusiasts around the world. Since it was acquired by Circle, we’ve reduced customer support tickets from 200,000 to under 500 and dedicated tremendous engineering resources to revamping core infrastructure, ultimately bringing stability to the Poloniex platform. With many of the exchange’s most pressing needs addressed, we’ve been able to shift focus to curating Poloniex markets and adding new features to the platform. In the past several months, we were the first exchange to allow Bitcoin Cash prefork trading, added support for institutional users, listed a host of new assets, and were the first exchange to add support for FOAM and Livepeer. The addition and support of Grin on Poloniex is representative of our dedication to moving the crypto space forward by bringing liquidity and support to promising projects and providing a more robust platform for our customers. Going forward, expect more promising assets that meet our Circle Asset Framework, more UX improvements, more features and more support for innovative projects like Grin! Originally published at blog.circle.com on February 14, 2019.